What is the beat in your heart? It’s there for a reason. Given to you. Not someone else. Will you listen to it? Will you follow it? I heard a motivational video ask “How much could someone pay you to give up on your dream?” Ouch. How long will the beat call to you before you silence it with doubt? The price of doing nothing is not free. Keep The Cross Alive is mine. It came from above. Oh sure you say. Well, all I did was pray. Pray. Pray. For over a year. And then…a simple act of being inspired to help someone turned into something more. 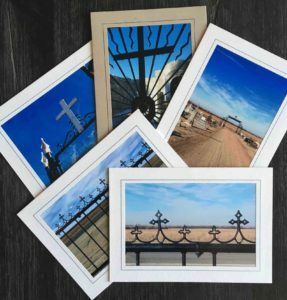 I had an idea to use the photos of crosses I had been compelled to take, with no intent to do anything with them, and turn them into greeting cards. To find out if an idea is “something,” you have to step out. That means you STEP…out, on faith. It’s not going to roll up all nicely presented to you. You use your faith to take a chance. I heard Craig Groeschel recently say “You have to step out, to find out.” What does this mean? You work for it. You do all the little things. Push through the little voices of doubt, push through the frustrations of not knowing and just take the first step. Then you do the next step. And then another. You persevere. It is called “walking in faith” for a reason – forward action to create movement. And as my faith has grown, this beat in my heart has become stronger. Unrelenting. It chants in me: Get more crosses in the world. I still don’t know all the how’s, but I take steps of faith EVERY day. Everyday I do something to get closer to my goal. Every. Day. Being faithful to what God has placed in my heart. 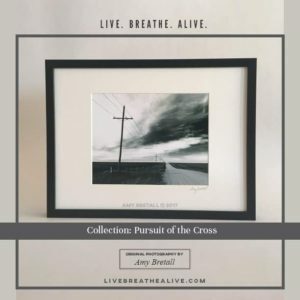 I BREATHE in faith and the beat in my heart comes ALIVE. What do you live for? What is the beat in your heart? Tell yourself: I will LIVE my inspiration. BREATHE in Faith. Be ALIVE in your Faith.